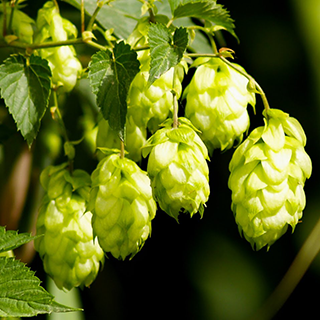 The strobiles, or female flowers, of the hop plant have been used since the 11th century for brewing beer, while the Romans used the leaves as a salad herb. The plant, which is native to Europe, is sedative and bitter, so it is used medicinally both for nervous disorders and digestive problems. It is also estrogenic, leading to a loss of libido in men who regularly drink large amounts of beer. Take 20–40 drops (1–2ml) in water 3 times a day as a sedative for nervous tension and anxiety, to stimulate the digestion in poor appetite, and to ease gut spasms and colic. For insomnia, use 2–4 fresh strobiles per cup of boiling water, infuse for 5 minutes, and drink 30 minutes before bedtime. Freshly dried hops can also be used (older plant material is less effective). Use a standard infusion of fresh or freshly dried hops (above) as a wash for chronic ulcers, skin eruptions, or wounds. Add 2 tsp (10ml) of tincture to 4fl oz (120ml) of water, soak a pad in the mixture, and use as a compress on varicose ulcers. growing positions when established. Alternatively, propagate by softwood cuttings in spring or early summer. Cut down old growth in winter. Collect the strobiles in summer.